Boeing and Airbus - who's flying higher? Clearly, the airplane manufacturing sector is a classic duopoly between Boeing (BA.US) and Airbus (AIR.FP). This is an excellent industry structure with extremely wide moats restricting another genuine competitor entering. A classic duopoly in a structural growth sector will lead to high levels of economic rent being extracted by the duopoly players in what is becoming an extended “supercycle” for next-generation plane demand. Boeing estimates 42,730 new commercial planes will be required over the next 20 years. While there’s a clear argument for holding both aircraft manufacturing players, we believe the outlook for Boeing is superior to Airbus. We also think the potential disruption to supply chains in Europe around a possible “hard Brexit” is another reason to favour Boeing over Airbus in the short-term. 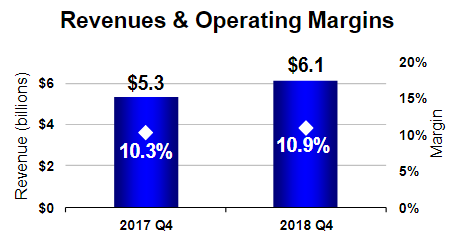 Boeing’s Q4 result and 2019 guidance further confirmed our conviction in Boeing. Let me explain why. Boeing delivered a record 806 commercial airplanes, including 256 737 MAX’s. They increased the 737 production rate to 52 a month, and recent industry speculation is they will ramp up to 57 per month from July 2019. Almost unbelievably, Boeing's just in time supply chain and manufacturing process for 737’s is so efficient they assemble a 737 on the production line in just 9 days. Yes, you read that correctly, 9 days. 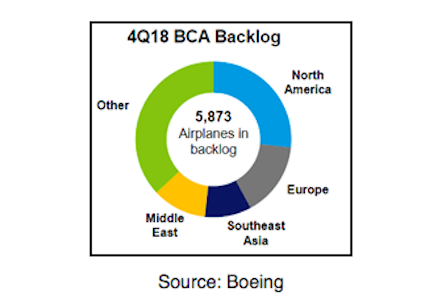 Despite my view that Boeing's consensus earnings will prove conservative, on current consensus earnings estimate the company remains undervalued. 2019 sees consensus EPS growth of +24%, yet the current P/E is 20.7x. The 2019 price to growth ratio (PEG) is just .86x. The dividend yield is 2%, and the balance sheet is exceptionally strong due to low debt and very high free cash generation. The free cash flow yield is currently 8.8%. Stay up to date with the latest news from Aitken Investment Management by hitting the 'follow' button below and you'll be notified every time I post a wire.